Board-certified internist, Gina Curry, MD, is a primary care physician with Lisa Larkin, MD, and Associates. 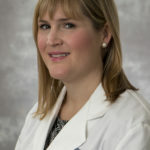 She received her Bachelor’s Degree from the University of Dayton and her medical degree from the University of Cincinnati College of Medicine, where she also completed her residency in internal medicine. Dr. Curry most recently served as a primary care physician with Group Health Associates in Cincinnati. Dr. Curry says she was drawn to medicine at an early age. She enjoys primary care because of the ability she has to form meaningful relationships with patients that allow her to provide personalized care. She has special interests in hypertension, diabetes, hyperlipidiemia, headache treatment, and mental health. She also enjoys caring for young patients who may be transitioning out of pediatrics and into the world of adult medicine for the first time. A native Cincinnatian, she enjoys running, gardening, cooking and spending time with her family. She and her husband have two young children and live in Hyde Park.